Westerners who pretend to know about Turkey but in fact know nothing often naively believe that anyone imprisoned who is a journalist must be imprisoned unjustly. Ignoring the fact that our Prime Minister has said these people are murderers and terrorists, they harp on as if journalists, unlike everyone else, should be exempt from incarceration. What these Orientalist Islamophobes do not understand is that journalism is one of the most dangerous weapons ever devised by the hand of man. A book, as our Prime Minister has suggested, may in fact be a bomb. When wielding the pen, one must therefore handle it with the utmost care, and be always mindful of one’s civic duty, which is this: do not upset the delicate ship of state – particularly at times when that ship is navigating perilous waters. In recent months, some of our news organizations have been criticized by foreigners for the manner in which they covered the terrorist riots known as the ‘Gezi Park’ events. In fact, they deserve praise. When chaos grips the country, and when thousands of angry marginals are doing their best to turn the centres of our cities into war-zones, what is the responsibility of the press? Is it to emulate the foreign media: incontinently, maliciously covering the events, crowding into the squares with their television cameras, beaming them across the world, fuelling the fire? Fortunately, some of our media organizations understood that the moral core of their profession is not to cast a hasty eye until the government has explained to them what is going on. In the absence of certainty, they took the responsible course: Noble Silence. Of course, we now know very well that they were right to do so. Like many of us, they sensed almost instantly that there was an ugly plan behind these ‘protests’. The fact that they were able to discern this without the support of any evidence is a testament to their sharp instincts and acumen. Our enemies, lurking in their boardrooms and greedily eyeing opportunities to leech off us, sprung their trap. We know very well who they are, but naming them would only make us the target of ill-founded and Islamophobic accusations. In concert with their local allies and other international forces who have long plotted Turkey’s downfall, they set in motion the events we call “Gezi Park”. This is now a well-established fact affirmed by everyone apart from those who deny it, and who therefore must be criminally involved in it. In fact, the sinister nature of the Gezi Park events is so plainly evident that we can only regard with the deepest suspicion any ‘journalist’ who gives them the oxygen of publicity without clearly emphasising the dark games that lie beyond. Some of these so-called ‘reporters’ have gone further, violating all norms of Turkish newsgathering by publishing information that has subsequently been proven to be false. Inaccuracy, as we well know, is anathema to the newsman. Is it really credible that some of our national newspapers actually believed that a young man in Hatay could have died after being struck in the head by a police tear gas canister? To this question, some of our naïve Western friends may perhaps answer ‘yes’. What these arrogant, biased simpletons do not know, however, is that in Turkey there is a dark history of collusion between the press and the tutelage structure nested within the state. All too often in the past, it was the journalist who acted as midwife to the coup monger, slyly wiping his dirty hands in mock innocence after delivering the screaming, bloody babe of military rule. No, false reports of the kind we saw during Gezi are terror, plain and simple, and I applaud every effort by our citizens and courts to bring these malefactors to justice. In shepherding us towards the sunny uplands of Advanced Democracy, one of the enlightened measures of our current government has been to reform the country’s anti-terror laws. Thanks to this, Turkey has become by far the most successful country in the world in identifying and imprisoning terrorists. Here we are not so naïve as to believe that a terrorist is simply a man with a bomb or a gun skulking in the mountains. A terrorist is the 19-year-old university student shouting ‘Hükümet istifa!’ A terrorist is the radical leftist ‘environmentalist’ who tweeted for her to go out onto the streets in open rebellion. A terrorist is the hack with sedition in his heart, cynically recording the student’s actions then broadcasting her rebellion across the country. I fervently anticipate the day when all these terrorists are in prison, the foreign provocateurs have been rooted out and sent packing back to their governments, and the rest of us can live in peace. It cannot be long now. A picture of Anne Bury and Veli Acar, at Veli’s family home near Dalyan. Photo by Warren Allott. As Turkish cities are again rocked by violent clashes between police and protesters and the country whips itself into dangerous hysteria, the British press is in town. We’re not in Istanbul, Ankara, Hatay, or any of the other centres of unrest, but in the picturesque Aegean town of Dalyan covering the murder this week of British woman Catherine Anne Bury by her jilted Turkish lover Veli Acar. Contrary to what some Turks may believe about the foreign media malevolently eying and exploiting their affairs, we are mostly interested in what’s happening here when it involves our own citizens. Unlike any of my stories about Gezi Park, my story on Tuesday about the death of Anne Bury appeared on the front page of the Times. It was a particularly upsetting murder. Three generations of the same family – mother, son, and grandmother – on holiday celebrating the mother’s birthday when a gunman invaded their home at night, wounding the son and grandmother, before shooting down the door to the bathroom where the mother was hiding and killing her as she cowered on the floor. The Telegraph, Mail, Sun, Express, and Mirror have all flown correspondents and photographers out from London to race around Muğla Province chasing the story. Over the past few days we’ve interviewed the murderer Veli Acar’s parents, his best friend, Ms Bury’s son Alex, who is in hospital recovering from a shotgun wound to the leg, and Veli Acar’s English ex-wife as well as various other friends and neighbours. When people learn about these kinds of stories they are generally filtered through the broad stereotypes that the format of news and tabloid journalism inevitably engender. Drawn from the reporting of myself and other correspondents here over the past two days, this is an effort to give a slightly more humanized version of what appears to have precipitated these awful events. According to Veli Acar’s family and friends, he and Anne Bury met about seven years ago, when he was in his late 30s and she in her late 40s. He was a captain on a tourist boat in Dalyan and she took a trip with him, which led to the start of a relationship. She was a lawyer from near Middlesbrough in northeast England, but was working for a company in Saudi Arabia. According to Veli’s family and friends, she would visit Dalyan about four or five times a year for between a week and two weeks at a stretch, and they would spend time together on his boat. They would visit his home and have dinner with his family. I went to the family bungalow outside Dalyan, which was modest and rundown in comparison to other dwellings in its small village. The family farm oranges, lemons and pomegranates. Dursan Acar, an elderly and sickly man suffering from diabetes, told us that Veli is one of six children, and the only one who is unmarried and does not have children of his own. “They lived like man and wife,” said his father. 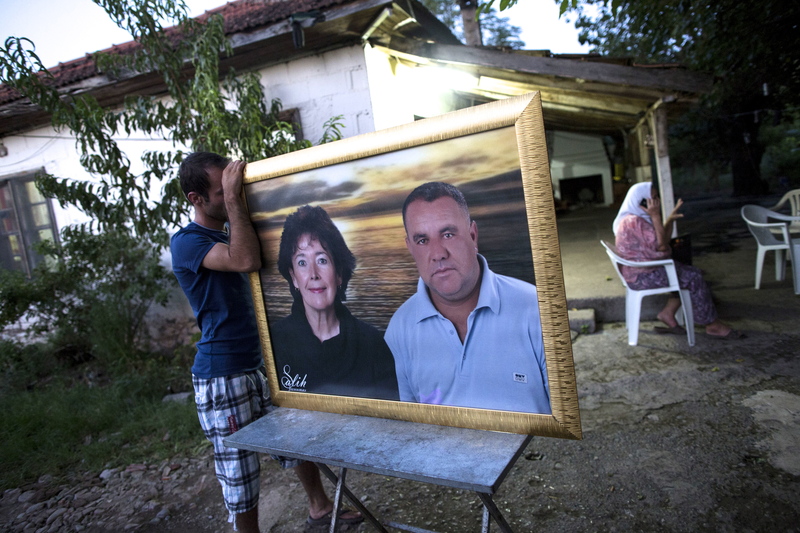 “We loved Catherine [Anne] and she loved us,” said Veli’s mother Müzeyyem. They showed us pictures of Veli with tourists on boats – laughing in the water, smiling in group shots – a very different image from the brutish, grim-faced man photographed being led to court handcuffed and flanked by jandarma. Veli’s family didn’t have any pictures of him and Anne together, but they did have a huge, dusty print in a faux-gilt frame concocted from separate photographs that showed the two of them in front of a cheesy seaside sunset. It was a creepy object and perhaps offered some insight into the pair’s relationship. It was composed from passport photographs: them both staring ahead with blank, formal expressions. It was at once utterly un-intimate, but also seemed to be a testament to the intensity of his obsession. One of his friends told me that this or a smaller version of it had hung in Veli’s boat. About three years ago, Özay Akdoğan told me, Anne bought a pair of luxury villas in Dalyan and the couple ran it as a tourist operation. Veli would pick up people from the airport, take them to stay at the villas, and then take them out on his boat. Recently, some kind of money dispute developed between them in relation to this business. At some point in the last few months there was an electrical fire at the villa and Veli had to sell his boat to Özay to repair the damage. After that, he fired the man who was working there as a caretaker and began doing the work himself. According to some accounts, Anne had ended the relationship because he was demanding money from her. Anne’s family seem to have been totally unaware that any romantic relationship existed between them, and still claim that Veli was nothing more than a gardener. They issued a statement yesterday saying that reports that they were a couple were “completely untrue”. Mr Acar’s parents believe her family’s lack of knowledge may have inadvertently helped precipitate the murder. They said in particular that her 24-year-old son Alex was unaware of the relationship and that they had not seen him visit Dalyan before. 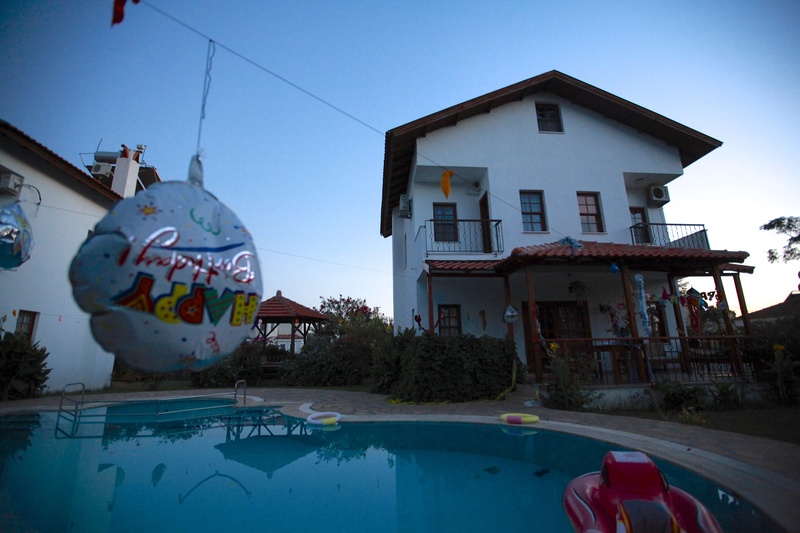 The villa in Dalyan in which Anne Bury was murdered on Monday morning. Veli swept all the raki glasses off the table and an argument ensued that ended in his angry departure. The family then called the jandarma and told them they were scared because Veli had threatened to kill them. The jandarma arrested Veli and held him overnight before releasing him with a warning. At some time between 5am and 6am on Monday morning he returned to the house with a pump action shotgun. I spoke to Alex in the hospital on Tuesday evening. He seemed keen to talk: I guess it was because he had been sitting alone in the bed for the past day and a half, without visitors, books or English-language television, unable to easily communicate with staff and probably turning the events over in his head. He described waking in the middle of the night and seeing a figure over his bed brandishing a gun. He had stayed up late because he was anxious after the earlier argument, and had only got to sleep about an hour earlier. “I recognised it was Veli and I tried to reason with him. I told him it didn’t have to be this way.” Veli gestured for him to go through to the other bedroom where his mother, and grandmother Cecilia, were sleeping. “They had locked the door because they had heard our voices,” he said. At this point in our conversation, the hospital’s security guards realized they had admitted me to his room without gaining the proper permissions and asked me to leave and return in the morning. I did not hear the rest of Alex’s account, and since then the family have decided to manage all press contact through the British Embassy. According to other published reports taken from the Turkish press, presumably originating from the police or jandarma, Veli then shot Alex in the leg (he suffered a broken tibia and a severed main artery and vein). He shot Cecilia in the back, although it was a light injury and she has since been released from hospital. He then shot Anne as she lay on floor hiding in an upstairs bathroom. Last night, it still did not seem entirely clear to me whether or not the pair were in fact lovers at all. Could Veli be a meticulous and convincing fantasist, capable of making his family and closest friends believe he was in a relationship with Anne? Could his family and friends be mischaracterising the relationship in order to lessen the legal penalty for the murder? In Turkey, ‘crimes of passion’ tend to receive lighter sentences. Any doubts over this question have been more or less laid to rest, however, by the Telegraph, which scored today’s scoop: an interview with Veli’s Scottish ex-wife, Ruth McGarry, who said she divorced him in 2010. Miss McGarry said she and Mr Acar were together for more than ten years and, while he had a shotgun and loved hunting, she would never have believed him capable of killing anyone. In enquiring about the mentality behind this awful murder I am by no means seeking to excuse it. Also, if I have humanised the perpetrator more than the victims, it is only because the latter – quite understandably – have been reluctant to share their side of the story. At this stage, however, it seems this tragedy may have hinged on Anne and Veli’s vastly different perceptions of their relationship. Speaking to Veli’s friends and family, it’s clear his bond with Anne was of central importance to his life, and also to his livelihood. She, meanwhile, whether through embarrassment or a simple desire for privacy, kept that relationship secret from her family. When it began to break down, Veli’s sudden transition from ‘lover’ to ‘gardener’ before the unsuspecting eyes of her family must have been all the more humiliating and devastating. For Anne’s family, I imagine the fact that this stranger and interloper who took her life is now claiming a kind of intimacy with his victim must compound the awfulness of their loss. Update: Since I posted this, the Mail have run this story showing Mr Acar and Ms Bury together, for real this time, and shedding more light on their relationship.